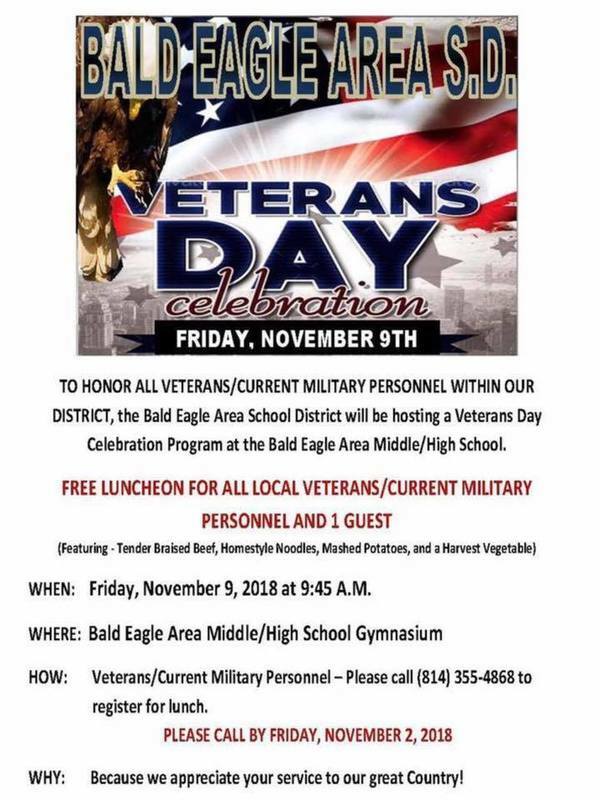 The Bald Eagle Area School District will be holding its annual Veterans Day events. A celebration and free luncheon will be held for local veterans and active military personnel and a guest. The event will be held starting at 9:45 a.m. Nov. 9 at Bald Eagle Area Middle and High School. To register, contact (814) 355-4868 by Nov. 2. The day will begin with a welcome speech from Principal Jack Tobias, along with a parade of colors from the American Legion of Clarence, the Pledge of Allegiance, the Star Spangled Banner performed by the symphonic band and a presidential proclamation. Capt. Aaron Irvin will also be this year's guest speaker. Irvin, a marine, graduated from BEA in 2003. The district held a similar event last year with a ceremony that honored local veterans and members of the military. Tobias said that was the first year the district held the event at one place with the entire student body. The event also included a performance from the school’s symphonic band and choir, and feature speaker Chief Master Sgt. Robert Peters, a BEA Class of 1980 graduate. A goal this year for the Bald Eagle Area School District is to also double the number of veteran graduates they honor on its photo board, and is open to all BEA graduates who are serving in the military or who have served in the military. The plan is to add photos of past or current service members to the veteran’s picture wall. Anyone interested should contact Annette Threeton at annette.threeton@beasd.net, and provide her with your photo, name, rank, branch of military and BEA class year.